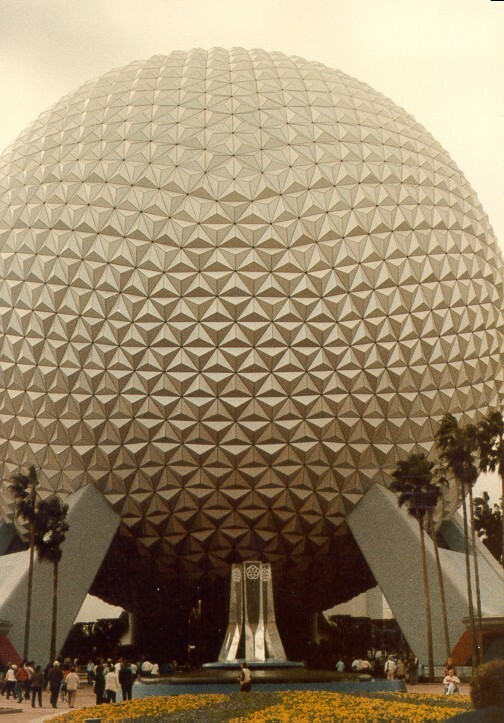 On today's show, Mike and Mark talk about attractions at Epcot that need updating or replacing, or should be changed back to what they were before an update or replacement. Mike and Mark talk about rides that need updating or replacing, or should be changed back to what they were before an update or replacement. Discussion started with the EPCOT Center entry plaza, where it went from wide open with many flower beds and a lovely central fountain to the closed-in feel with the Leave a Legacy monuments. Mark compared the monuments to the reactions of Disney Legends Bill Martin and Morgan "Bill" Evans about the "cake-stle" created for Walt Disney World's 25th anniversary. Mark compared the inviting openness of the original plaza to the roadblock feel of the monuments. Mike and Mark both have tiles on the monuments, but both would like to see them moved from their current location (much like the Sorcerer's Hat at the Studios). The original EPCOT Center entry plaza, with planters and a lucite fountain featuring the park's logo, provided a much more welcoming feel. Photo by Mark Goldhaber. Next up was Spaceship Earth, where the narrator was changed from Larry Dobkin (great trivia question) to Walter Cronkite to Jeremy Irons to Dame Judi Dench. While Mike and Mark both had mixed opinions of the updates, they weren't quite ready to say "change it back." Mark also talked about the original dining reservations viewscreens at the exit to the attraction, and noted some of the changes in that area. Discussion worked its way around through Communicore to The Living Seas/Seas with Nemo and Friends, The Land, Imagination!, and World of Motion/Test Track, including a short discussion of what's coming with the imminent redesign of Test Track. There were only a couple of minor disagreements. The most vehement "Change it back!" from both Mark and Mike was for Journey Into Imagination with Figment (version 2.1) to go back to Journey Into Imagination (version 1.0). After Test Track, we ran short of time and had to stop for this show. We'll pick it up next time with the most egregious replacement that calls for a huge "Change It Back!" Let us know which attractions should be updated, replaced, or changed back! John Papas in New York wrote in to tell us that his kids love the sweepstakes aspect of the One More Disney Day promotion. Pete Altemese wrote in to wish us a happy fifth anniversary. Dave in San Francisco wrote in to both wish us a happy anniversary and to describe why he was disappointed by the One More Disney Day promotion. We finished out the show with some silliness due to exhaustion and the late hour of recording. Thanks to our announcer, Andrew Rich! 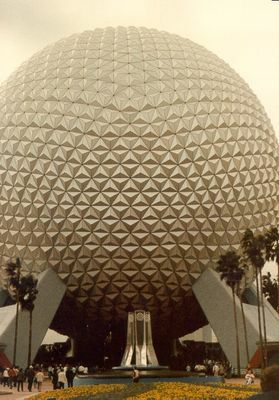 The first thing I would change is the voice of Dame Judi Densch in Spaceship Earth, I remember vividly when the new changes were made and her voice just detracts from this great voyage. The first voice and that of Jeremy Irons were voices that made the attraction seem special, Dame Densch's voices lends nothing and actually, for me, detracts from the attraction. She may be "M" to Bond, but she makes me want to jump off the spaceship. Lost Horizons. Want it back. I really like the new version of SSE. I thought the previous version was good, but the new voice-over and music are really good. And I like the giant monoliths in front of SSE. It makes the whole place look more futuristic. MissionSpace was a great replacement for Horizons, and I like the new Journey into Imagination (the purple dude freaked me out). My kids love the Nemo theme at the Seas, which means we'll actually do that attraction each time, instead of "maybe" going to see it. The only thing I miss is the Living Statues in Italy. I don't know if that counts as a change, but I wish they would come back. I undersand how Siemens would want to update a newly sponsored old attraction, but the execution was horrid. I can handle Dench, but Irons was SO much more mysterious and compelling. Perhaps they thought that was too 80s/90s to be so dramatic. The music - what a HUGE waste of money to re-score something that was entirely perfect to begin with. And the descent - to waste precious on-ride time with a video game that could be in the exit alone...I'll never get over that. I don't have a lot of history with Epcot, the last time I went was 2009 and the time before that was so long ago that I only remember bits and pieces, so I'll keep this relatively short. Spaceship Earth: As I mentioned I don't remember much of the older versions, but I will say that I'm not a fan of the current version of the ending, the video is cheesy and clashes with the tone of the rest of the ride and there certainly must be something better they can do with the ending. Spaceship Earth is one that gets updated fairly regularly anyway, and so with the next update the ending is on the top of my list of things to change. Circle of Life: Again, I have no point of comparison, but I think Circle of Life is heavy handed and obnoxious. I have no problem with preserving the environment or "going green," but this show just does not work for me. If they want to promote environmentalism it'd be better to do it with a more serious tone than having three beloved characters degraded to mascots for a political agenda. This one definitely needs to be replaced. Journey Into Imagination! with Figment: This one is awful. There's nothing here that sparks imagination, just revulsion; Figment is loud and obnoxious, the ride is trite and uninteresting, and the Imagination Institute theming is now irrelevant since Honey, I Shrunk the Audience is gone. In a land that's focussed on the Future I think looking backwards is a bad idea, but this is one of the few instances where I'll say without hesitation change it back. You're not going to get any better than the original here. Captain EO: Captain EO is a fun bit of nostalgia, but let's be honest, it's pretty clear that in both parks its nothing more than a placeholder. Honey, I Shrunk the Audience had past its expiration date, but WDI hadn't come up with something new for the space yet so they capitalized on the Michael Jackson mania. I like Michael Jackson, and I don't mind the show, but I'm ready for a new attraction to take its place. Test Track: To me Test Track has always felt kind of half-done. It's fun for what it is, but it should be something more than that. Hopefully this new update will bring it up to its full potential, but I guess we'll have to wait and see. I personally think the direction the pavilion should take is trying to marry the ideals of Test Track and World of Motion; a more distinct focus on transportation history combined with the excitement of a modern thrill ride. For everything I didn't mention just assume that I'm more or less content with what's there. It may not all be perfect, but I don't see any pressing need to update, replace, or change it back. As I mentioned in the past I love this show topic and I can't wait to hear part 2. Mike and Mark, I have to disagree on your views regarding Captain Eo's new life at EPCOT. I understand it not being someone's cup of tea, but I was ecstatic when it returned to the Disney Parks. I loved it way back when, and I love it now(even if it's missing the in-theater laser effects) My five year old absolutely loves it as well. She sings along to it louder than the speaker system. You don't have to be a Michael Jackson fan or a child of the Eighties to dig it. She is proof of that. While I wouldn't mind seeing Magic Journeys again, I by far prefer Captain Eo. Honey I Shrunk the Audience I can do without. I agree with you guys on the EPCOT entrance 'graveyard' as you put it. It's more of an eyesore than a 'welcome to the future' design element. And I can't add much more to the loss of the original Journey Into Imagination discussion that hasn't been said already. I never understood why it was ever changed in the first place. Looking forward to Part II, and Happy 5th Anniversary to you! I wish they would ditch the Nemo stuff at The Living Seas. It is a horrible waste of a great aquarium and way too cheesy for WDW. I understand wanting to do something new, but the old show was a lot better and tied together with the marine life in the tank. And they really need to do better maintenance on the big tank. A lot of fish (of the few there are now) looked sickly and really bummed me out. I remember this as a great attraction with a lot of colorful fish. Now it's just a plain old big aquarium with very few fish and other creatures. Nemo is a such a cop out of a refurb. Change it back!